Right in the heart of North York! THE TOWERS OF 5959 YONGEARE SELF-EVIDENT ICONS FOR AN UPLIFTED LIFESTYLE. Our 2-Storey Grand Entrance Lobby Lounge is immaculately designed and provides around-the-clock security year-round. It is unheard of to find a condominium with 1 acre of amenities, but 5959 is a building that defies comparison. With sophisticated, modern and contemporary design, 5959 Yonge Street sets a new standard elegance. 5959 is the only residential building in the world with a multi-use court. 5959 has partnered with an American grocery store to occupy the ground-level retail space. This tech-savvy retailer will offer virtual shopping which can be accessed through their app. 5959 is ideally located at the top of Toronto, on Yonge Street a pinch above Finch. Take a moment to register now for exclusive information. Enjoy 40,000 sq.ft. of Indoor and Outdoor Amenities. State-of-the art amenities are what 5959 seeks to provide. At 5959, you have access to an incredible range of luxurious amenities to help you relax, exercise, entertain and be entertained. Our amenities tour begins on the ground floor where you will discover a two lane, ten-pin bowling alley that is fun for everyone. Another opportunity for friendly competition is the very unique multi-purpose LED court that creates the lines and boundaries for your favourite game with the push of a button. Adjacent to the LED court is one of the building’s richly appointed Hospitality Rooms, ideal for intimate entertaining. Pet lovers will appreciate the convenience of having a do-it-yourself Pet Spa right in the building. When business is on the agenda, you can take advantage of the spacious and fully equipped meeting room and for overnight visitors there is a beautifully decorated guest-suite. The second floor of 5959 provides abundant opportunities to relax and entertain. On Game Night, invite friends to join you in the Sports Bar and Lounge with its multiple large screen TVs, pool table, bar and modular booth seating that is ideal for groups. It is easy to entertain in style when you have these two elegant Hospitality Rooms, each with its own bar, lounge area, private dining room and a shared prep-kitchen. Designed with rich finishes and dazzling appointments, these impressive spaces make every gathering a special occasion. For a show-stopping video experience you have choices: the cozy Media Lounge or The Theatre with its big screen, big sound and theatre style seating. The second floor also offers another Guest Suite and The Library/Meeting Room, a smaller meeting space than the one found on the first floor. The spectacular third floor combines amazing indoor and outdoor amenities that appeal to the mind, body and spirit. It is easy to unwind beside the sparkling reflecting pool accented by greenery and complemented by a cabana lounge. Put a lounge chair in the water and relax like you would at a tropical resort. Working out could not be easier with your own Yoga/Pilates Studio and separate Fitness Centre, complete with free weights and the latest cardio equipment. The indoor pool surrounded by expansive windows that overlook the city is the perfect place for morning laps, or just splashing around with the kids. The third floor is the perfect antidote to hectic urban living. You can relax in the Dry Sauna or Wet Steam Room or, let the Zen River Garden take you a million miles away. With its natural elements of stone, greenery, word and water, it is a serene space to decompress from your busy day. If you are considering dining al fresco, there are options: the Barbecue Patio or the Barbecue Bar and Lounge with its comfortable seating areas, sophisticated cabanas and flaming water feature. Under a warm sun or canopy of stars, the expansive rooftop terrace at 5959 is truly spectacular. The elegant Cabana Lounges create intimate spaces that are reminiscent of a 5 star resort. Sophisticated furnishings, lush greenery and glowing fire pits all conspire to create the perfect outdoor venue. It is further enhanced by sleek contemporary furnishings, a large reflecting pool, a juice bar and imaginative seating areas like the Serenity Garden. Here, outdoor dining can be simple or sophisticated with two separate barbecue areas and a generous dining terrace. Basketball, volleyball, squash, badminton and soccer have all been played the same way for decades, until now. 5959 makes it possible to play them all in the same space with the revolutionary LED Multi-Purpose Court. No other residential building in the world has the technology to change the LED lines and boundaries under the clear floor surface to match the game you want to play. With the push of a button, let the games begin. 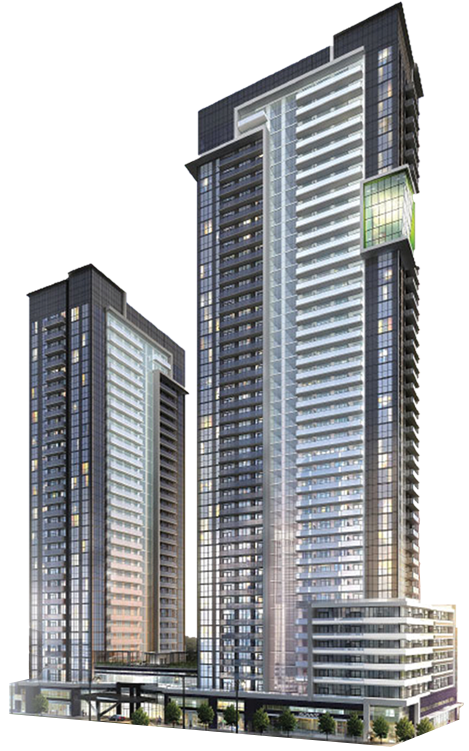 Ghods Builders newest condominium development, 5959 Yonge Street truly brings luxury and lifestyle to a whole new level. The development is home to approximately 40,000 sq.ft. of indoor and outdoor amenities. Located right on Yonge Street north of Finch Avenue.